This sign hangs in my booth at the street fair. And…it has definitely attracted lots of interest and commissions for dog portraits. As you can see from the sign, I paint individual dog portraits. My focus is on their expression and their features. Question: Will You Do DOG PAINTINGS Of Two Dogs? I really can’t capture the expression on a 20″x20″ canvas. The dogs will be too small. 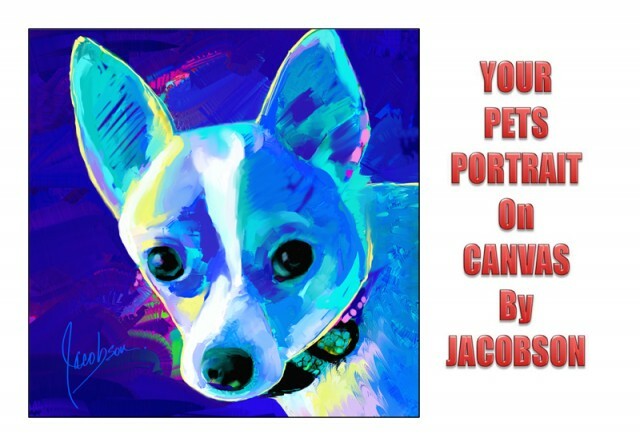 So my answer is always NO, I paint one pet portraits per canvas! And I’ve stuck to it. One dog paintings per canvas. I’ve been emphatic, and still got 40 commissions for dog portraits. And many were of two dogs in one family. 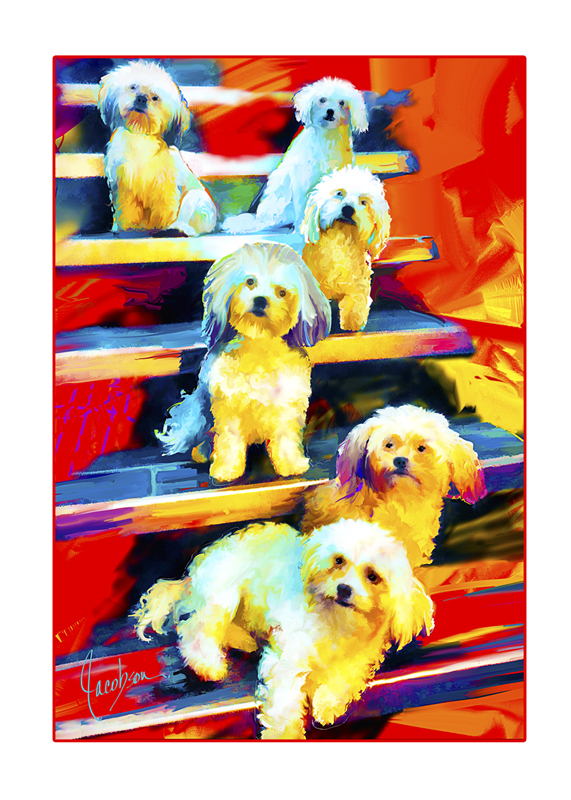 WHAT ABOUT 6 DOGS IN ONE PAINTING? In walked wonderful collectors of my paintings. And this was their question. 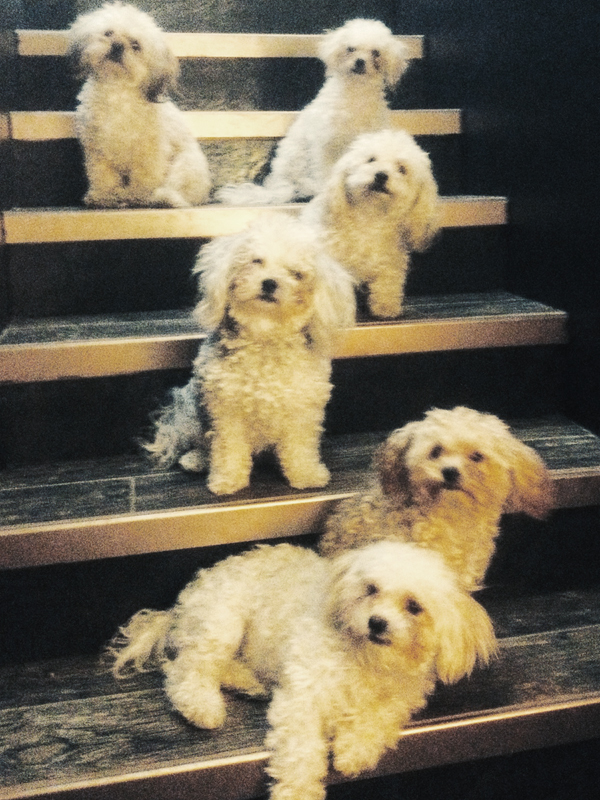 They have a great photo of their 6 dogs, and would love to have them painted on one canvas. I couldn’t resist this one. My question was…how did you get them to pose for this photo. Is it a photoshop stunt? But nope, this is the Pack, Mom and Dad and 4 kids. They agreed to a 30″ x 40″ canvas, with a Red background. They sent individual photos of each dog that I could use for expressions and features. They ordered one canvas and notecards. Today I received this notecard. Thank you so much, We LOVE IT! First thing I learned in art school. There are no rules. As an artist, follow your heart. I did and I’m so happy that I did. The Puppy Pack pet portraits was definitely worth every minute I spent painting. Did you miss this Article? Read it now and Enjoy! I post to the blog 1-2 times a week, with interesting articles…All About Pets and Art and a whole lot more. Are you subscribed to the weekly blog wrapup? If you enjoyed this articles, get email updates of the weeks articles in your mailbox every Monday (its FREE). Sign up below.